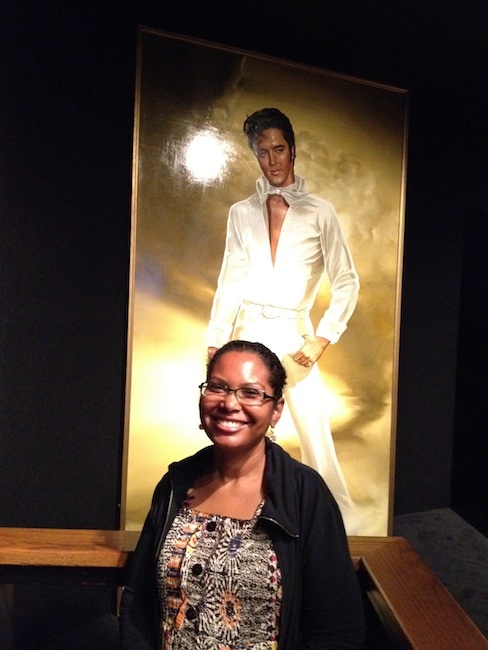 Hanging out at Graceland with a painting of Elvis done by a fan. Photo by Deborah Beete who liked Graceland more than she thought she would! Feeling discombobulated, off-kilter. As if I haven’t quite slipped back into my regular life since returning from Memphis. My eating’s off, my sleeping’s off. I’m having a hard time figuring out what I can take responsibility for (and then taking responsibility) and what’s out of my control and I need to just accept. It’s the heat, I think. And that I’ve strayed from reading my Bible regularly. And that I’m two weeks away from vacation and I’m having a hard time staying in the present and not yet living in those two weeks. I’m also writing a story on Elvis. Not many words on paper yet, but lots of thinking about details. (I think I’ve, in part, absorbed Mrs. Woolf’s method of doing a lot of pre-work in my head before moving to the page.) How do you fake your own death? How do you leave your child and take up another life? How do you make a living when you can’t do the one thing you really know how to do? I think this is also part of the discombobulation—moving between the world of the story and “real life.” It feels more jarring than returning from the world of a poem. And it’s a different thing for me—to write a short story based on a life that’s not directly related to mine. To have to figure out technical details when I usually write only for emotional truth. I know some people would say that it’s too early to get caught up in the details, but I feel that thinking through the details is actually revealing the character, the personality of the Elvis that’s showing up in my story. For example, my Elvis chooses to pass out on the toilet because he doesn’t want a way back to his superstar life. By the way, I feel a little silly writing an Elvis story. It feels a little too close to fan fiction. And maybe that’s what’s really discombobulating me—that I’m jumping off a cliff and I haven’t yet figured out where land is. And that is a (scary/terrifying/frightening) good thing. Posted on June 10, 2012, in Uncategorized. Bookmark the permalink. Leave a comment.